Are you excited for the colors of fall to start making their appearance this next month? 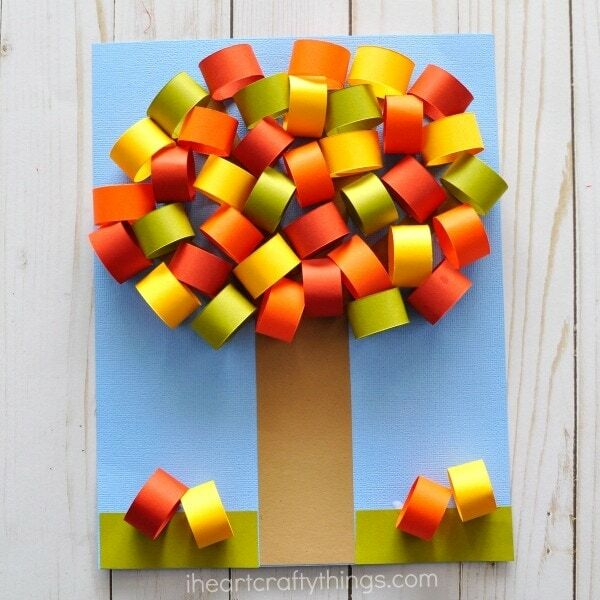 This fall tree paper craft is a perfect way to celebrate the beginning of the fall season. The beautiful red, orange, yellow and green colors mixed with the paper circles that pop off the page help to create a stunning fall paper craft that you will want to put on display all season long. 1. 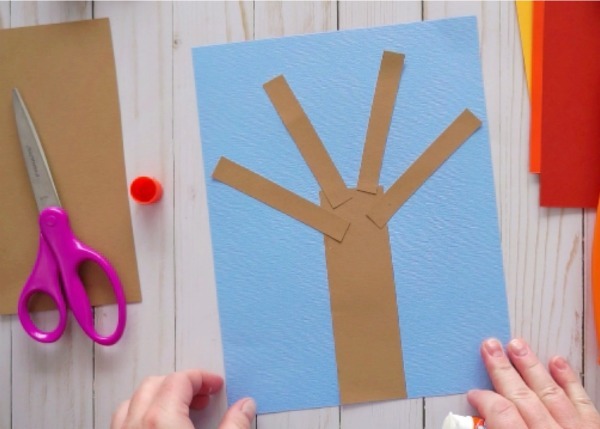 Cut out a tree trunk and tree branches out of brown cardstock. 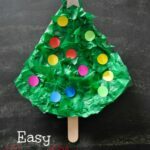 Glue them onto your blue cardstock to form a tree. You won’t see the tree branches in the finished craft but they are great for helping you arrange your paper circles on the tree. 2. Use your paper cutter to cut out small paper strips from your red, orange, yellow and green cardstock to make your paper circles. To do this, cut your sheet of cardstock in half. Layer the two halves together and then cut out 3/4″ strips from them. Your finished strips should be 3/4″ x 4-1/4″. 3. Add glue to the end of your paper strip and bend the strip to form a circle, connecting the other end to your glue and closing it shut. 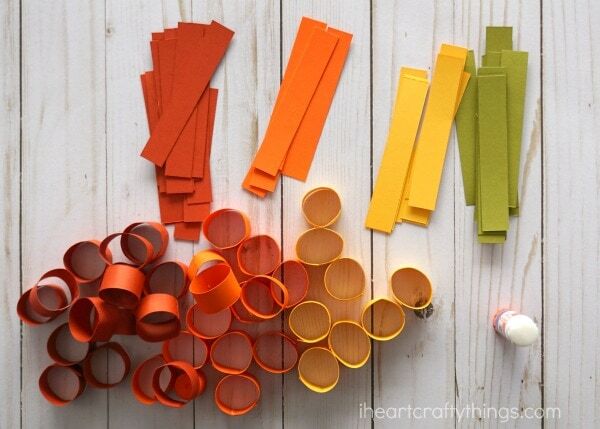 Continue making paper circles out of your red, orange, yellow and green paper strips. You will need about 40-50 paper circles for your tree. 4. 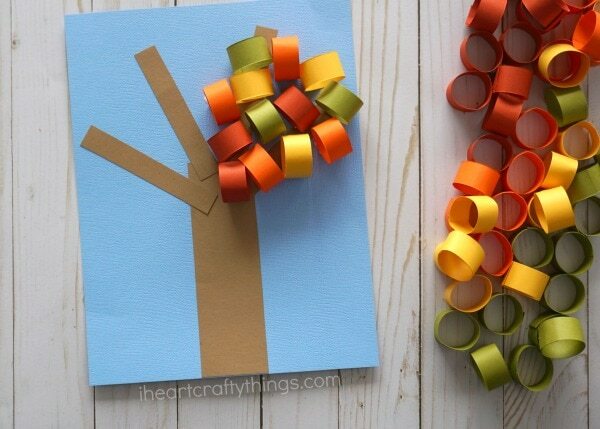 Add a dot of Tacky Glue at the bottom of your paper circles and glue them around your tree branches to make your beautiful fall tree paper craft. Continue until your tree is full of colorful leaves. 5. Cut out two green cardstock strips and glue them at the bottom of your paper to look like faded grass. 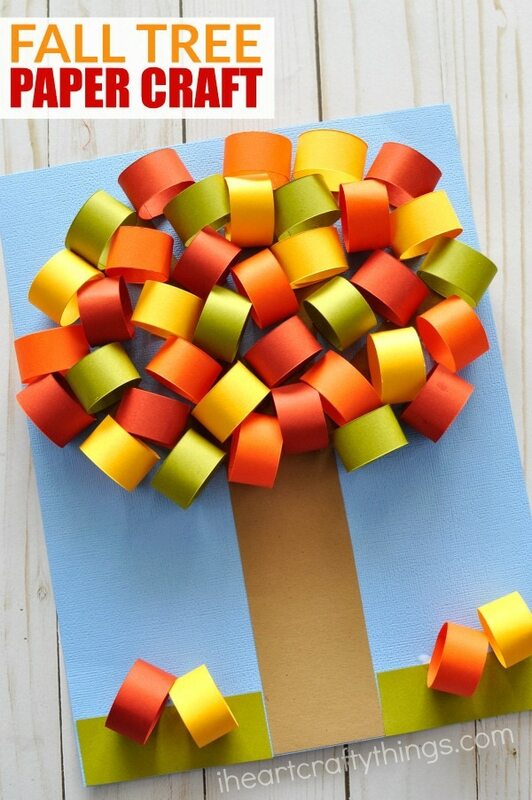 Finish your pretty fall tree paper crafty by gluing a few paper circles at the bottom of your paper to look like fallen leaves. 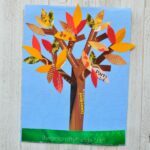 Your beautiful Fall Tree Paper Craft is finished! 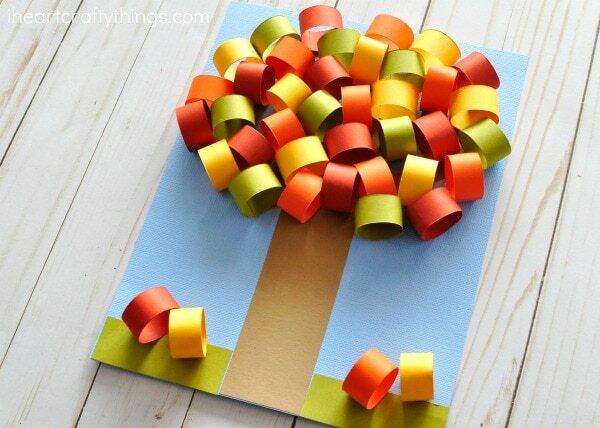 Looking for more fun paper crafts to make for the fall season? Here’s a fun way to turn a paper bag into a fun paper crow puppet. This paper bowl scarecrow craft is another fabulous fall kids craft. 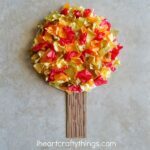 You might also love this fall tree craft made from one of our friends with recyclables. Excellent Fun Ideas for this Grandma !! !